PRISMs to Power the UK. : Wind Electricity is 1½ Times More Expensive than Nuclear! 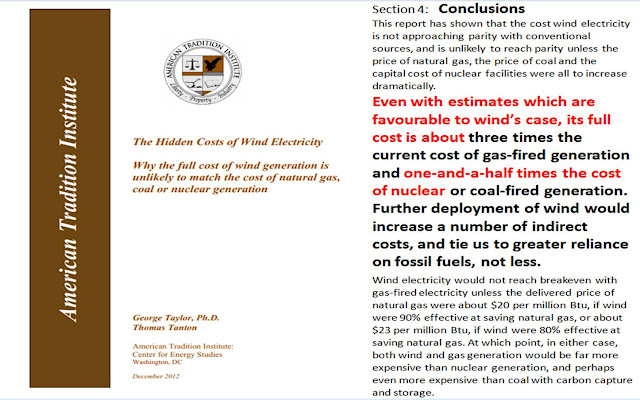 Wind Electricity is 1½ Times More Expensive than Nuclear! Don't you just love it, when something you instinctively know turns out to be true? This is the real cost of wind energy, with some of the intermittency and grid connectivity costs added in. This is not the percentages and totals figures the wind lobby throws at us and our gullible MPs - it's what has to come out of our hard-earned taxes, somewhere along the line: Wind Lovers - get off the Band Wagon while you can!